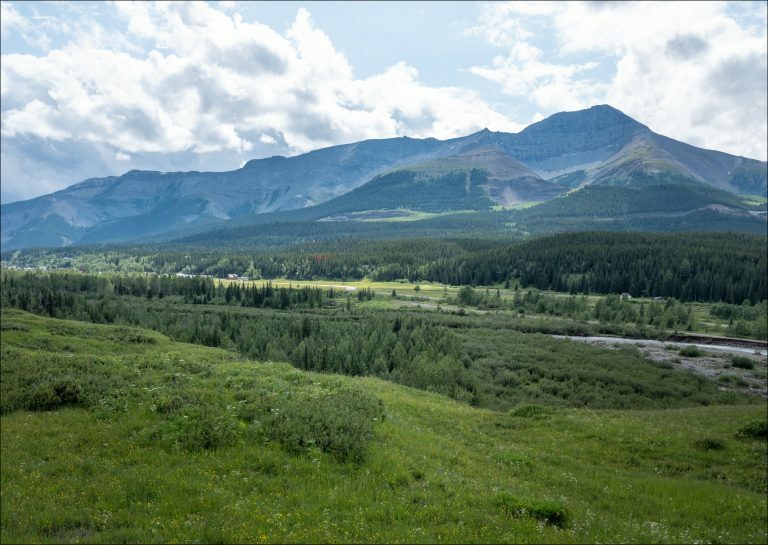 From July 23 – 26th, 2018 UVic’s Mountain Legacy Project (MLP) joined forces with Dr. Liza Piper from University of Alberta’s Kule Institute for Advanced Study (KIAS) to rephotograph images from the historic Alberta Coal Branch area. 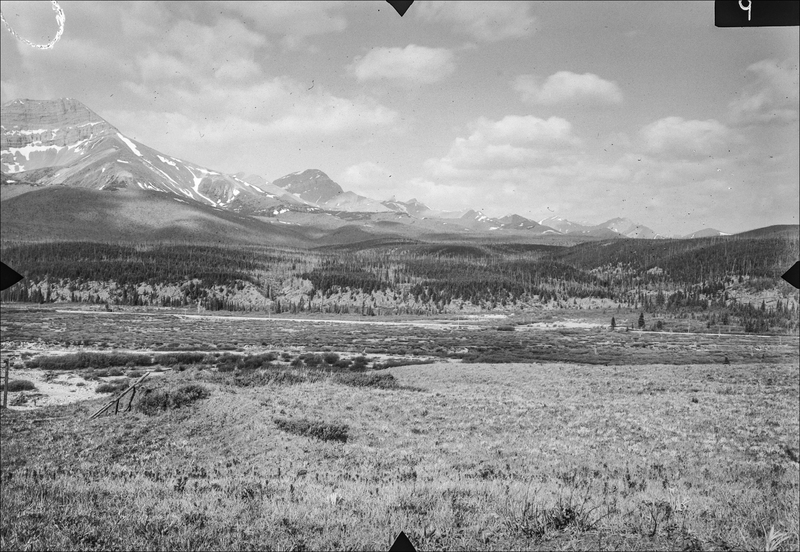 The team was repeating images taken in 1921 and ’22 by William Miller. 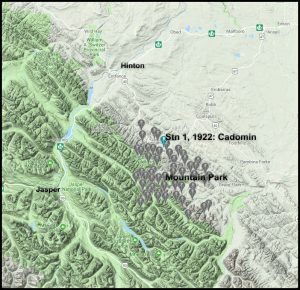 Working as a topographer for the Geological Survey of Canada, Miller commenced mapping in 1921 near Mountain Park, Alberta. Back then Mountain Park was a thriving company town with a community of about 1000 people – today only the cemetery remains. Miller completed approximatly 250 sq. miles of mapping in 1921 and added on to this in 1922 and ’24. The grey pins on the map indicate the stations he visited and took photographs from. 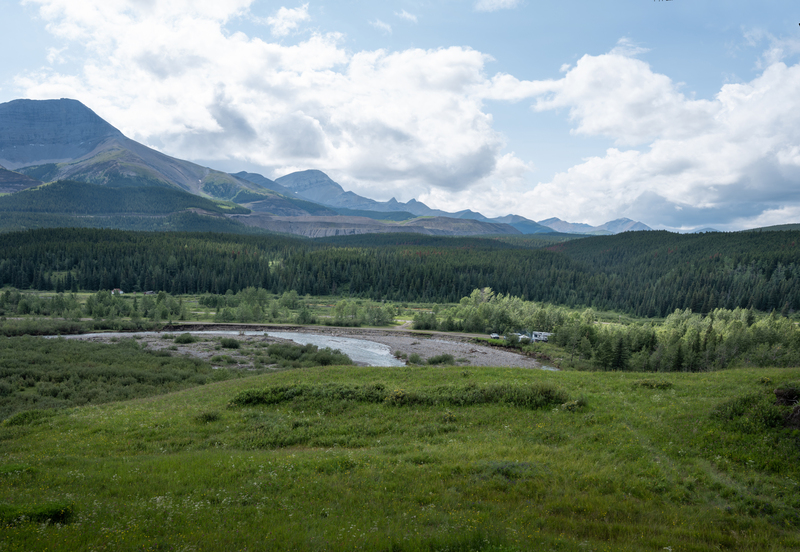 From our base at Whitehorse Creek Campground just south of the town of Cadomin the joint MLP-KIAS team visited 14 of Miller’s stations over two and a half days, rephotographing about 80 images. 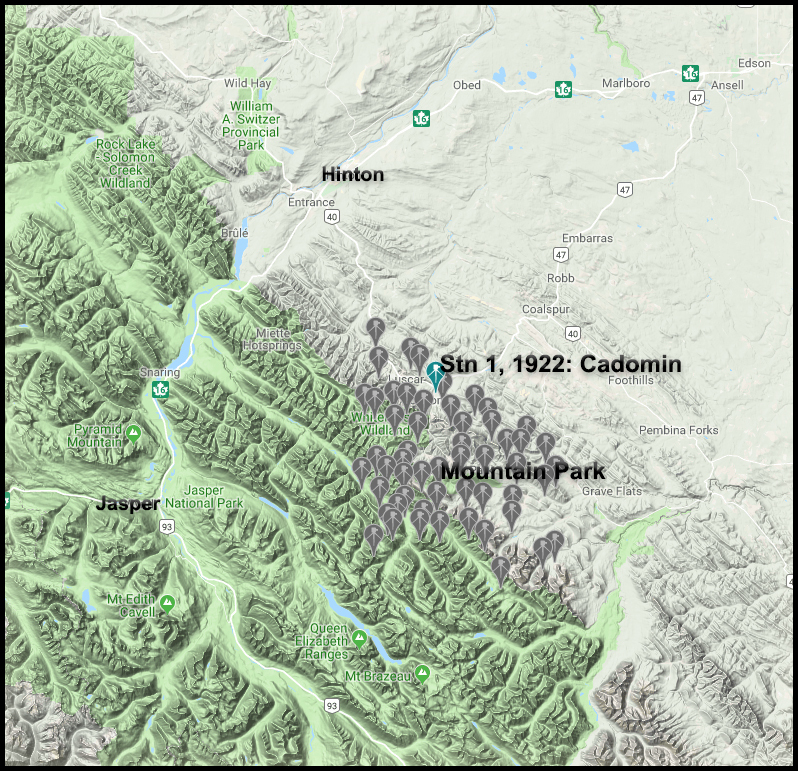 So far we’ve only had time to do a quick alignment and initial analysis on one of those locations: Station 1, Cadomin, 1922. The panoramas and individual images shown here are from that station. 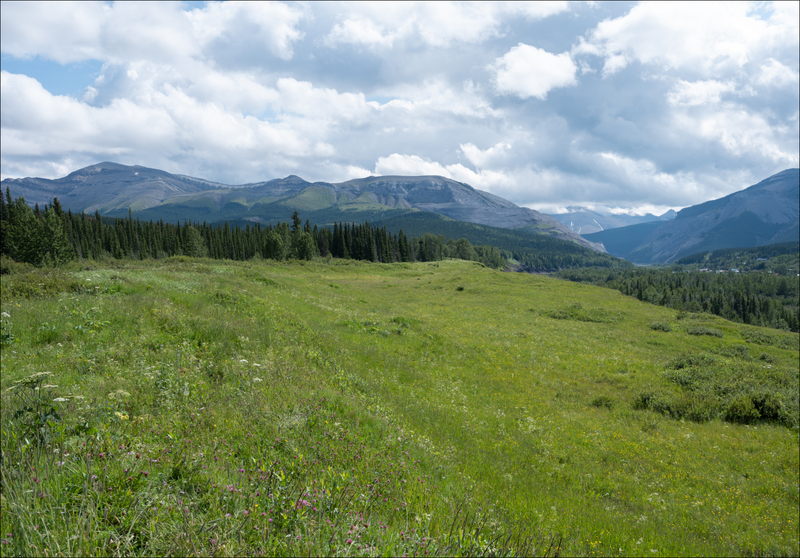 The rephotography in this area was particularly challenging because large portions of the landscape have completely changed. Lehigh Cement (formerly Inland Cement) and Teck Resources quarry and mine in the area. Lehigh quarries limestone in the Cadomin Mountain complex and Teck extracts and processes coal in two main areas here: Luscar and Mountain Park. Teck uses surface mining techniques in which soil and rock overlying the coal deposits are removed. 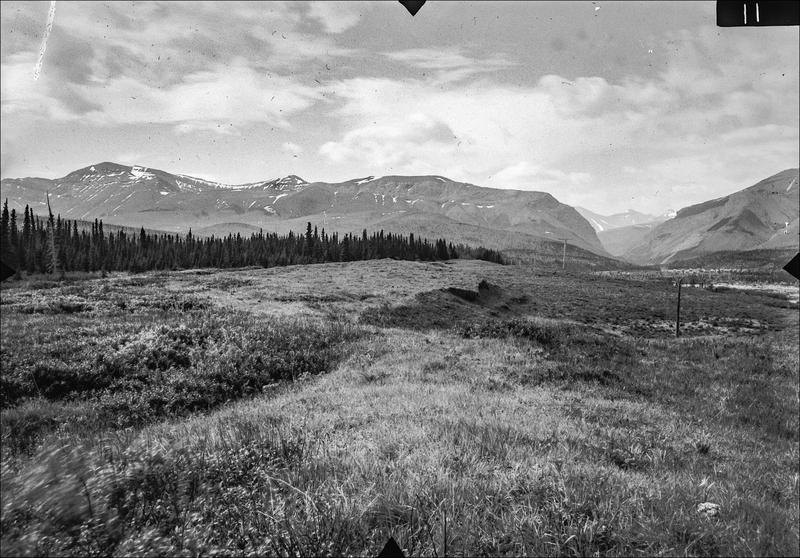 When a given pit is finished the land is reclaimed, but that too yields a topography that is different from the one shown in the historic images. 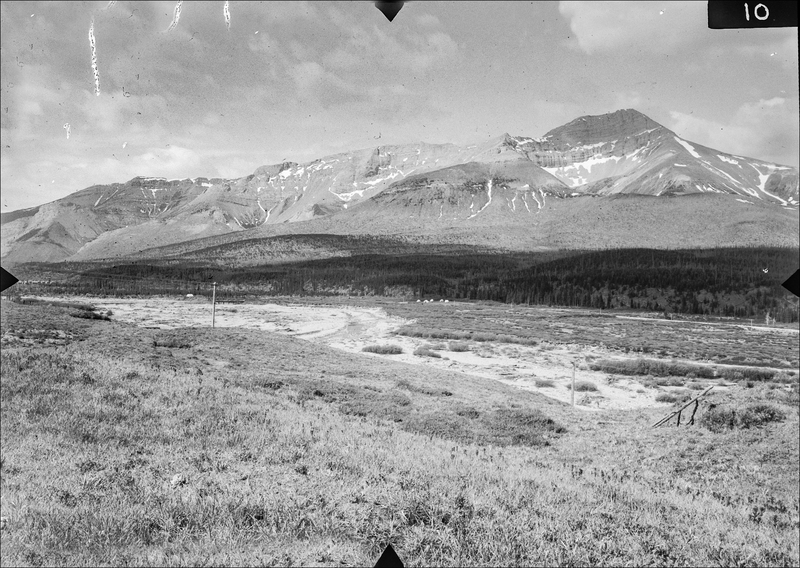 View the station and historic images on a map at Explore Mountain Legacy. Then take a few minutes with the images below and you’ll see some of the changes. This was the first station we were able to repeat and it was the only one where the full team gathered – after this we split into two groups. The morning proved to be a bit of a washout with low-hanging clouds obscuring almost everything. But, the clouds lifted later in the day and we all trekked out to repeat the three images making up Station 1, Cadomin: William Miller, 1922. Back row (L-R): Rick, Nathene, Julie, Sonia, Mike. Teck Resources Cardinal River operations.